Preheat the oven to 60°C, warm the bowls and plates. Rinse the potato sticks in cold water, thoroughly pat dry on a towel. Fill a pot half full with the frying oil and heat it to 160°C. Pre-fry the potatoes in batches for approx. 3 mins. per batch; the potatoes must not take on any colour. Remove with a slotted spoon, drain on a rack lined with paper towels, leave to cool. 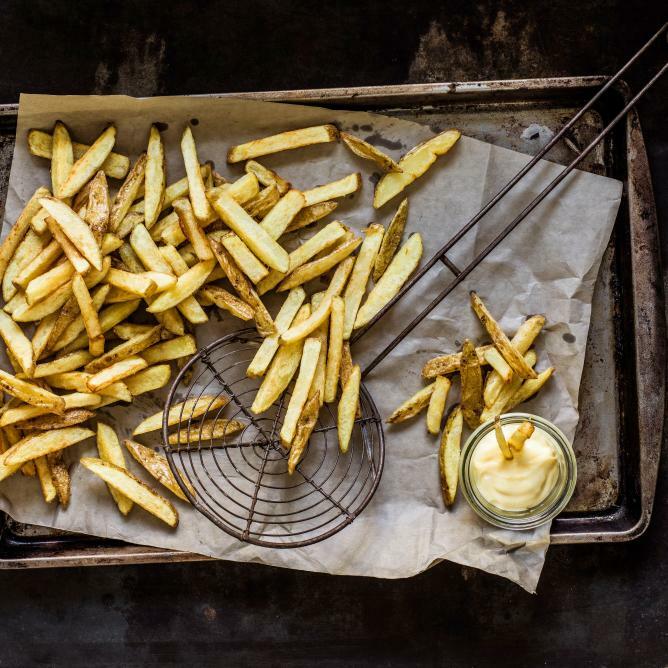 Heat the oil to 175°C, fry the pre-fried French fries in batches for approx. 3 mins. per batch until crispy and golden. Remove with a slotted spoon, drain on a rack lined with fresh paper towels, keep warm. Prop open the oven door slightly with a wooden spoon, season with salt. Dust the French fries with 1 tsp of curry powder or paprika.